Throwing a Halloween costume party? These printable Halloween invitations are perfect for any Halloween get together, school party, or even to use as greetings cards. We have some free printable quarter page fold invitations, as well as a customizable 5 x 7 flat card invitation and postcard invitations. Get creative and have fun creating your own handmade Halloween invites and cards! 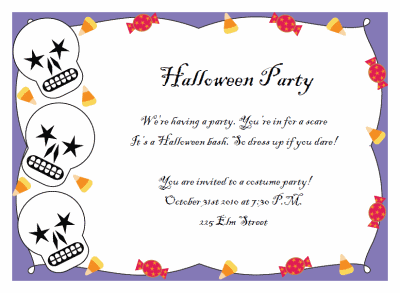 Customize your own Halloween party invitation! Use this template to create custom invitation in which you have the power to change the fonts, font size and color, alignment, and more. These invitation are a free printable PDF form. Simply download and open the file on your computer. Change the text to match the details of your party, then press "control" and "E" to bring a pop-up tool palette up. Use the tool palette to change the fonts and colors/sizes however you please! Print the invitations onto a paper of your choice and then use out cutting guidelines to cut the invites down to a standard 5 x 7 size flat card. You can use the invites as is or add colorful or decorative papers and cardstock, glitter, ribbon, and charms! Get creative and make your own custom and crafty handmade invitation creation! With these printable Halloween party invitations you can create one of a kind party invites! You will need Adobe Reader (the latest version is recommended) installed on your computer in order to open and read any of these files. You can get Adobe Reader here. (a new window will open so you can download without leaving this page). 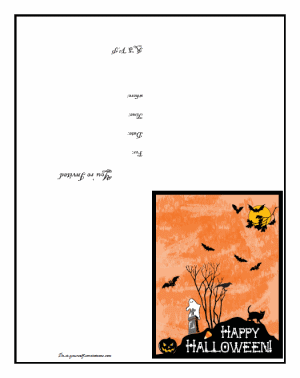 Use these quarter page fold invitations to create easy Halloween party invitations. I have included two separate printable invitations here. One has the artwork already included. Print it and fold into quarters for super quick and easy (not to mention affordable since it's free) printable Halloween party invitations. You can keep them as is or add some bling to make them a bit more crafty! Try adding some glitter or glimmer mist. Or maybe some colored rhinestones to give the pumpkin, ghost, or jack-o-lantern some glowing spooky eyes. Print them onto the paper of your choice and fold into quarters to create a quick and easy handmade invitation for your upcoming party. The second printable invitation is a completely plain, text only arts and crafts template. This template is great for anyone who would like to go wild and create completely custom and crafty handmade invitations. These are also fabulous to use as a kids craft project! Print them onto the paper of your choice or even some cardstock. Let you're kids at em' with some crayons, markers, glitter, glue, stickers, you name it... Hours of fun. 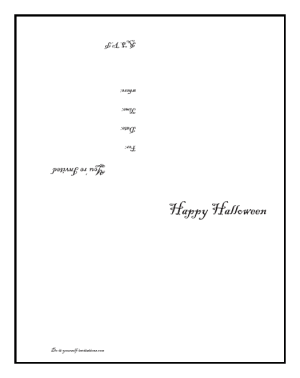 These printable halloween invitations can be used to make a simple quarter fold invite, or print them back to back (and upside down - opposite each other) onto some heavy cardstock to create standard side fold cards. Simply print them, cut the paper in half, and then fold in half. Viola! A nice little folded card!